To create a System DSN (which will be available to all users), select the System DSN tab. 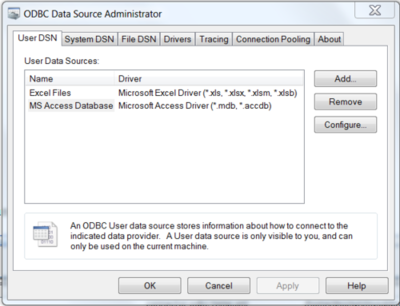 To create a User DSN, which will be available only to the current user, click the Add... button to open the "Create New Data Source" dialog. 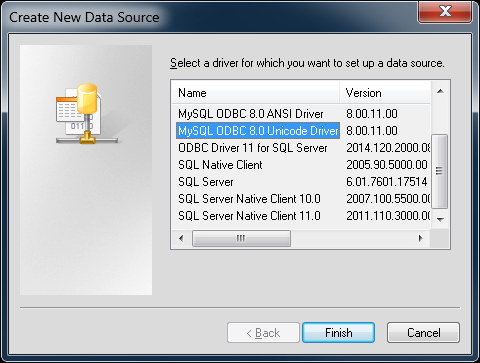 From the "Create New Data Source" dialog, select the MySQL ODBC 5.x ANSI or Unicode Driver, then click Finish to open its connection parameters dialog. To identify whether a DSN was created using the 32-bit or the 64-bit driver, include the driver being used within the DSN identifier. This will help you to identify the right DSN to use with applications such as Excel that are only compatible with the 32-bit driver. For example, you might add Using32bitCODBC to the DSN identifier for the 32-bit interface and Using64bitCODBC for those using the 64-bit Connector/ODBC driver. 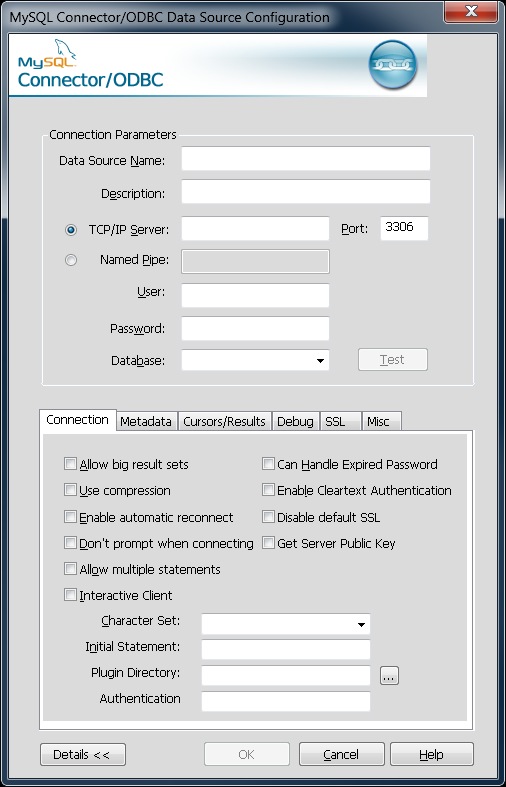 The Database pop-up should be automatically populated with the list of databases that the user has permissions to access. To verify the connection using the parameters you have entered, click the Test button. If the connection can be made successfully, you will be notified with a Connection Successful dialog; otherwise, you will be notified with a Connection Failed dialog. You can configure a number of options for a specific DSN by clicking the Details button. Connections, Metadata, and Cursors/Results enable you to select the additional flags for the DSN connection. For more information on these flags, see Section 5.2, “Connector/ODBC Connection Parameters”. For the Unicode version of Connector/ODBC, due to its native Unicode support, you do not need to specify the initial character set to be used with your connection. However, for the ANSI version, if you want to use a multibyte character set such as UTF-16 or UTF-32 initially, specify it in Character Set box; however, that is not necessary for using UTF-8 or UTF-8-MB4 initially, because they do not contain \0 bytes in any characters, and therefore the ANSI driver will not truncate the strings by accident when finding \0 bytes. Debug lets you turn on ODBC debugging to record the queries you execute through the DSN to the myodbc.sql file. For more information, see Section 5.8, “Getting an ODBC Trace File”. 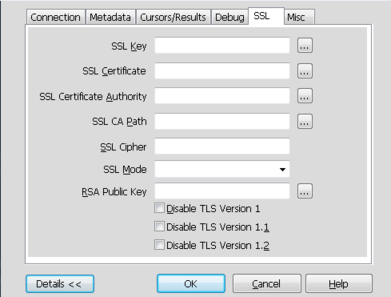 SSL configures the additional options required for using the Secure Sockets Layer (SSL) when communicating with MySQL server. You must also enable and configure SSL on the MySQL server with suitable certificates to communicate using it using SSL.